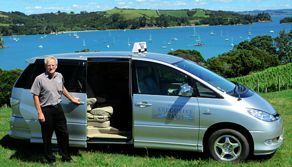 Our modern fleet of vehicles and professional drivers are at your service for all your taxi requirements on beautiful Waiheke Island. 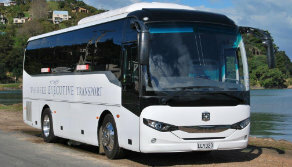 We are available for transfers from ferries, the airport, accommodation, vineyards and all event venues on Waiheke Island. Apart from wine tours we can arrange tours to artists’ studios and galleries. We are the largest operator of wedding transport and can get guests from ferries or any point on the island to the chosen venue, and return them to the ferry or accommodation. Hens’ parties are also catered for. 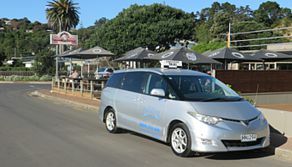 Charter solutions for conferences and special interest groups are possible as we have many vehicle options, from taxis and mini vans to air-conditioned buses in various sizes. We can carry one person or 150.